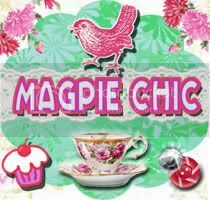 Magpie Chic: More Tea Vicar? ....The pretty stuff, not the boring stuff. 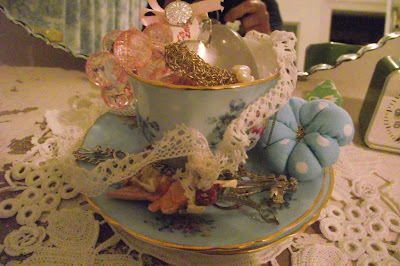 Cats feature often, as do tea parties, cupcakes and vintage fabric and the stuff I make it into. I have so many ideas I'd like to share. I hope you enjoy it. When life hands you a little yellow duck. These are my favourite recipes. They never fail me. He looks like such a nice boy since he had his hair cut! The Image Fairy Pays a Visit. 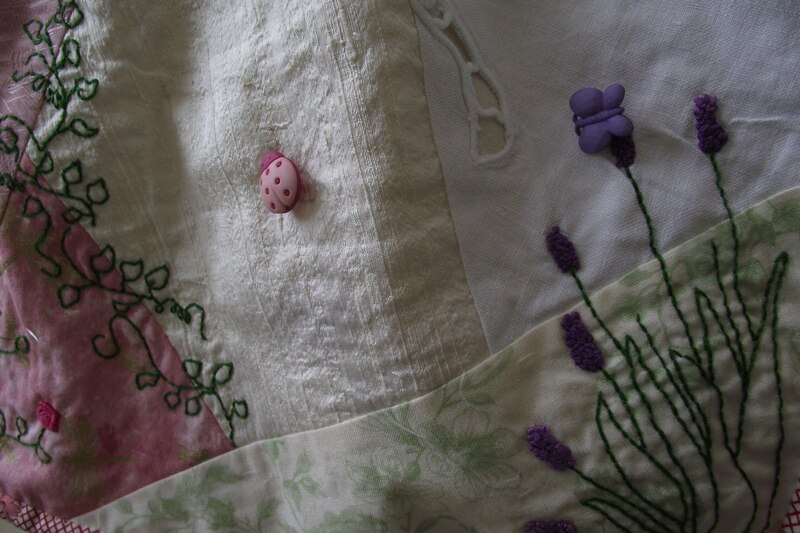 Re-arranging my Sewing Room - because I can! 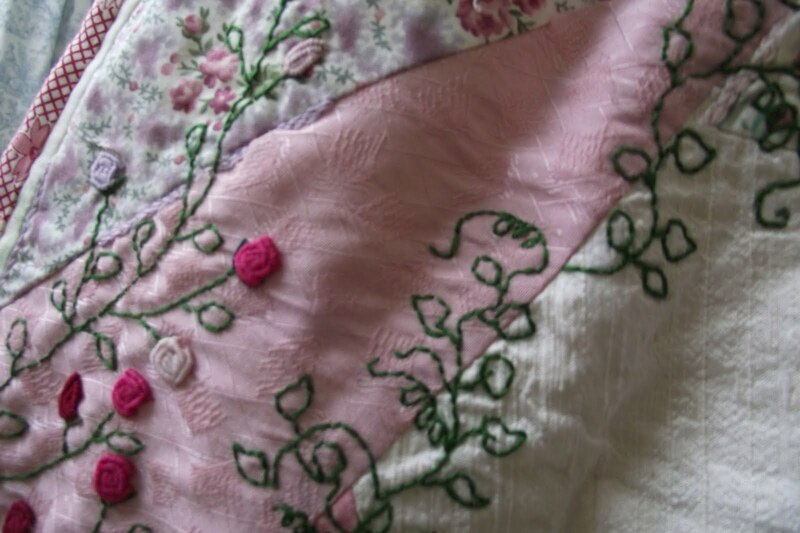 This is one of my favourite quilts. It's from a book called "Tea with Friends" by Bronwyn Hayes of Red Brolly. Magpie Chic loves shiny and pink. And a tussie-mussie of the last of the summer flowers. This is the blog that first inspired me. Please visit. 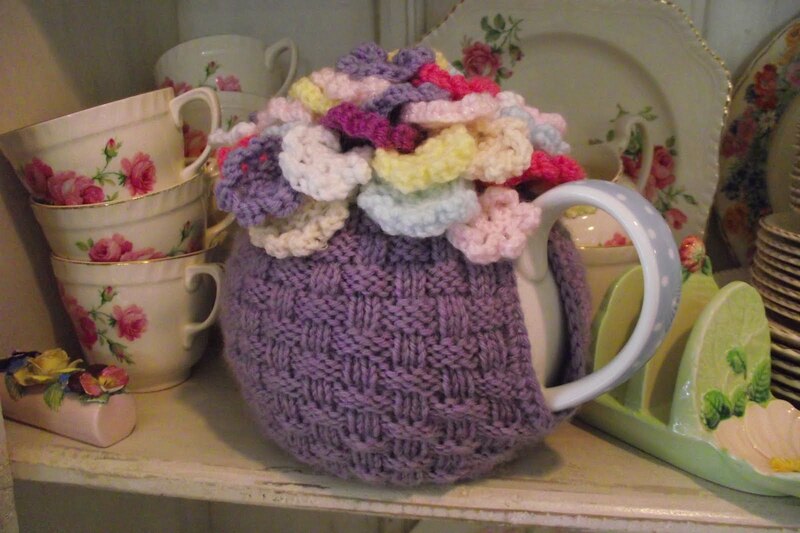 I've always wanted a tea cosy. 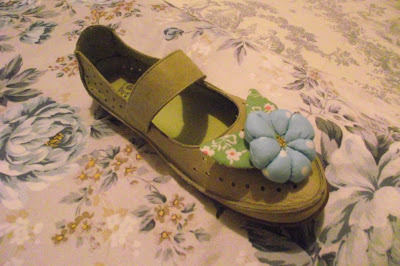 One of those old fashioned ones that look like what Granny would have worn on her head to church or the Easter Parade!!! Well now I have one in my very own colour pallet and everything! My Mum made it especially for me. She knew that my life would not be complete without one I guess. Just like Auntie Lex gave us a butter knife for an engagement present 25 years ago. Same reason LOL. I've moved it round my "Granny China" cupboard, auditioning it in several places. I've finished Val's bag too. I'm very happy with the way it turned out. And ... despite rumours to the contrary last week, I've finished Cooper's mouse hat. It has matching mittens too, but they wouldn't have fitted the dolly well enough to show you. 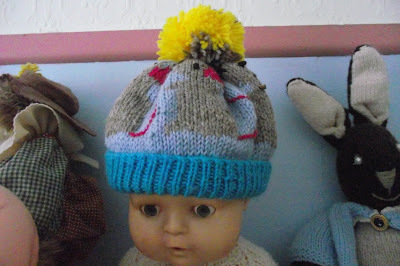 I had to borrow Dolly's head to model it at it's best advantage. 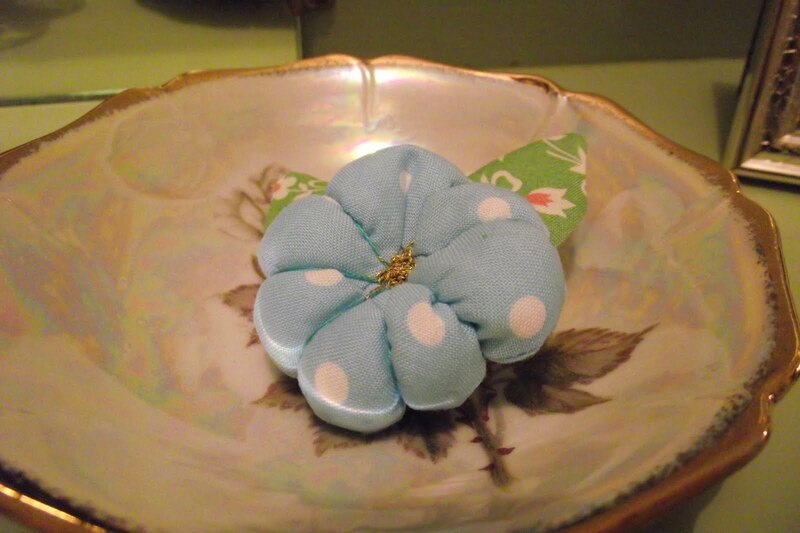 The other thing I've been experimenting with this week are the little button flowers made by Emily at Ravenhill. She's done a very easy to follow tutorial about how to make them here. She's also invited everybody to post photos on her flikr group around what they've turned them into. 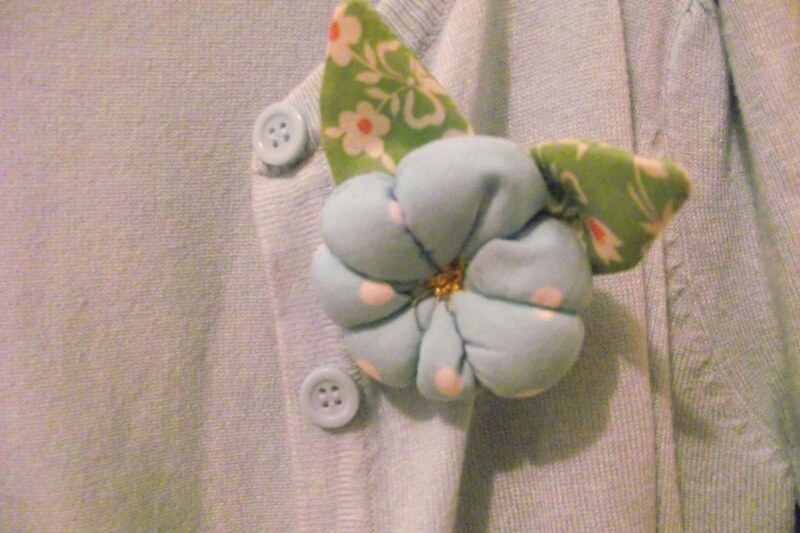 That's the Cute as a Button Flowers Flikr Group. I turned this one into a brooch, just made some leaves for it. Then I did my usual trick and spent about half an hour taking photos of it all around the house, just because it made me happy. 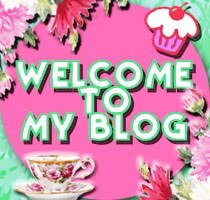 I know you are all inflicted with the same bug, so I am in good company with my blog chic confessions LOL. Back again next week blog chics. Did I happen to mention that I'm off to Jo Segar's Cook School tomorrow:P? Ooh, I'm jealous, I want the bag AND the tea cosy! Now I want to make a cosy like that too... Where did your Mum get the pattern? 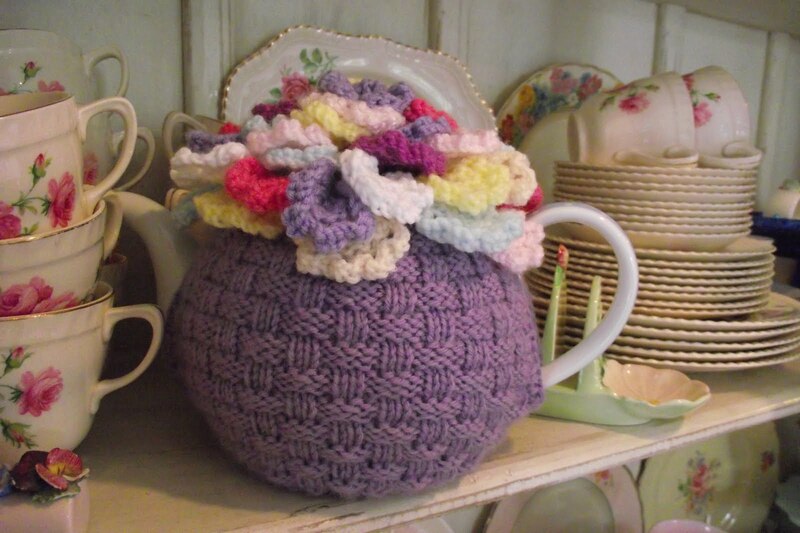 I love your tea cosy, purple too! 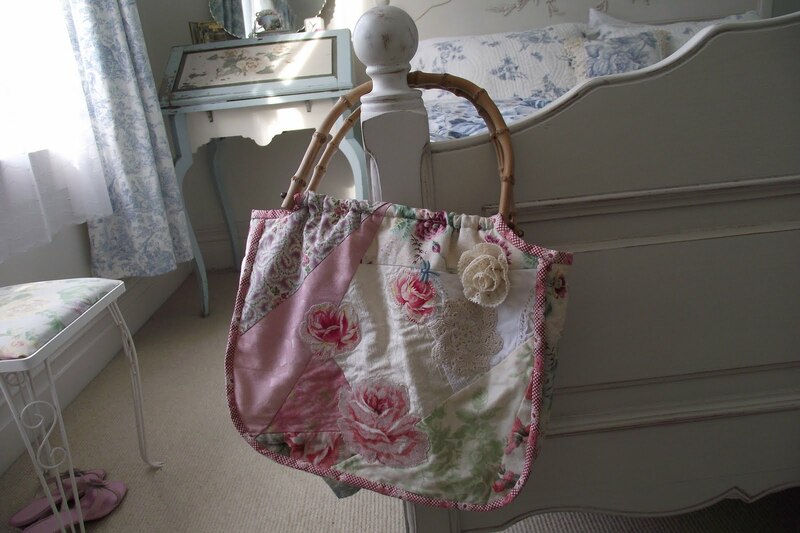 The bag is gorgeous too! I'm gonna have to go over to that blog now and see the flower tutorial....more things on my to make list!! Very cute tea cosy...love the bag. 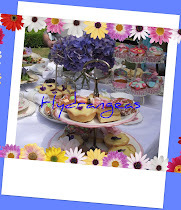 I found your blog when I googled Cinnamon Lodge in Hawera, I was wondering if Clare has her website up and running yet? 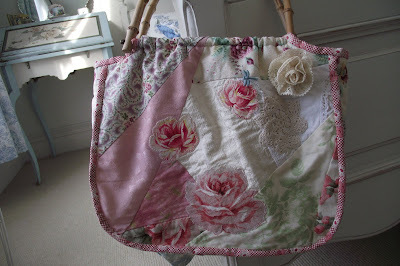 The bag turned out fabulously--your embroidery added so much to the finished result. 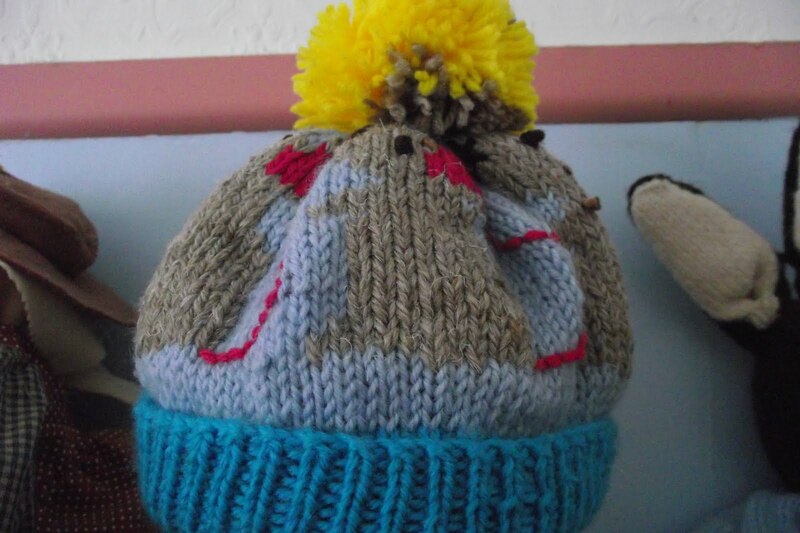 I'm the same way with things that delight me so I understand perfectly about your tea cosy! 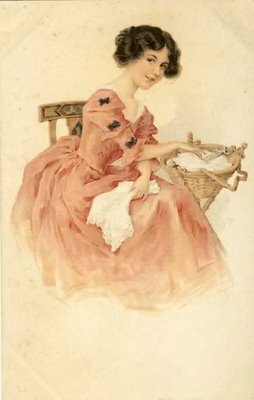 I just found your blog and was delighted to find out you are a fellow kiwi :) I spent quite some time browsing and I love everything I see. I am also a BIG fan of the Port O Call Cafe in napier, if I could live in a shop it would be that one! 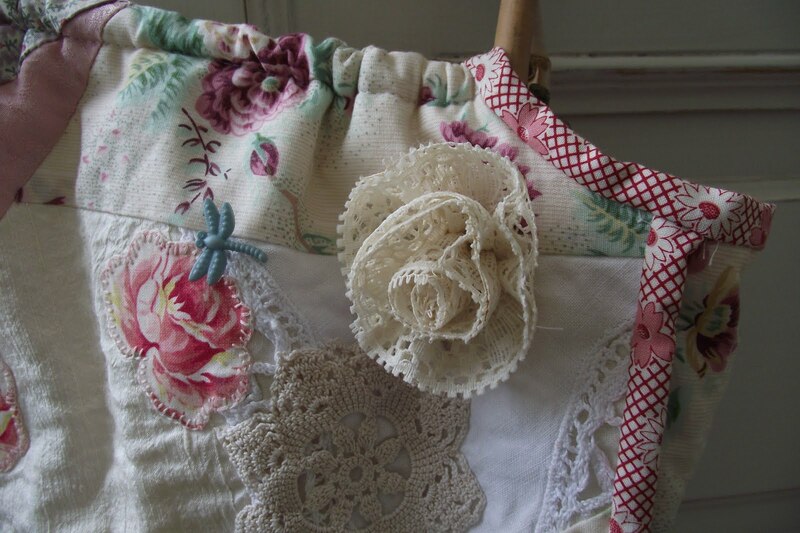 Thankyou for the up date on your friends shop, and thankyou for your kind comments. my favourite things (and current obsessions)! She who is proficient at separating eggs! "Another novelty is the tea party;an extraordinary meal in that it has no object but distraction and delicate enjoyment." My cats drink only from china cups! You are most welcome to use any of my images (excluding my blog graphics) that are not attributed to or linked to someone else. Just please link them back to my blog. Thank you for stopping by. 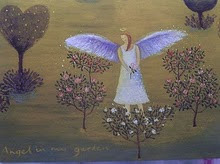 Sometimes there are fairies in my garden.